Want to become a Potato Farmer? Create a drainage hole in the bucket. This should be done by an adult with a hammer and nail. 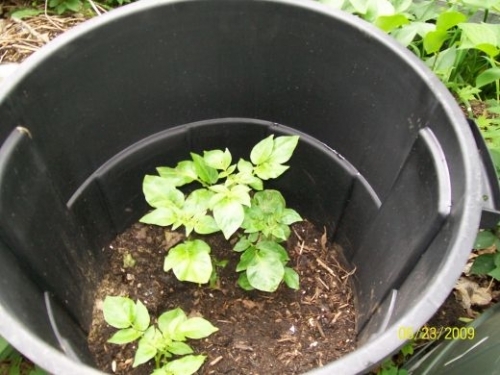 Once the spout on the potato is hard, fill the bucket half-way with the compost or soil. Place the two potatoes in the bucket with the sprout facing up and place the bucket near sunlight (but not directly in the sunlight) Sunlight can burn the potato leaves. Don’t forget to place newspaper or a plate at the bottom the bucket to catch any water or dirt. To grow your potato you need water, but not too much! Make sure the soil is moist and water your plant every 3-4 days. Potatoes also need food that is found in the soil. If you’re using compost the food should already be there but if you’re using soil you may want to purchase some compost. Potatoes need to grow in a temperature-controlled environment of 10-15ºC. If some leaves fall off before your potato needs to be harvested don’t worry, this is normal.